Don't guess if you have used enough postage on your outgoing mail. You can make a postage scale for home use. This is a guide about making a homemade postage scale. At times I wasn't certain if outgoing mail needed more than a 1 oz. first class stamp, so I'd have to drive to a post office. I decided to build my own scale and it works. A simple balance-beam scale is easy to build. Comparative mass for a one ounce weight (28.3 grams) is almost exactly the same as five modern US quarters (28.35 grams). In my picture I included five quarters in the packages at each end of the scale. It seems the loaded envelope plus stamp is a tiny bit heavier, so I need to add postage. All I needed was an inexpensive laundry hanger section, a few paper clips, and a tool or two, and I was set. Chuck, this is such a simple and helpful tip. Thank you for the picture, it makes the simplicity of it perfectly clear. This is a great idea. However, there is a tiny error in your setup. The stack of quarters is roughly an ounce, so you would attach it to one end, not to both ends. 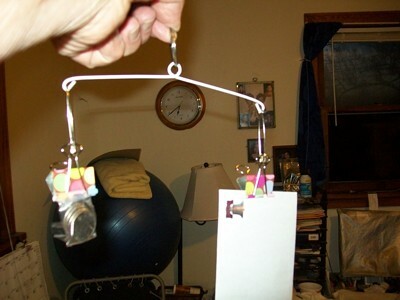 Attaching the weight to both ends should give you equilibrium, in other words the scale should be balanced perfectly, of course the envelope and stamp will make the one side a tiny bit heavier, attaching most anything to the other side will make it heavier. What you want to do is only attach the weight to one side then clip the envelope on the other side alone. If the weight side goes down, in other words if it is heavier than your letter, then your letter weighs less than an ounce, no extra postage is required. If it balances then your letter weighs an ounce and should not need extra postage, at least not a full first class stamp, in my experience if a letter needs a tiny bit more postage they will either leave a postage due notice in your box or just over look it. If your letter is heavier than your weight then you need at least one extra first class stamp. I just use my digital kitchen scale to weigh mail. Simple and fast. Wouldn't be without it. So versatile.